The P200 motor was great but needed a little more power for the San Francisco hills. The front drum brake stopping power and dive were both really bad. The clutch cable would snap after about 6 months of use (always in the rain when I had to get somewhere fast), and was much harder to pull than a P200. Premixing the gasoline/oil was a hassle. Kick starting was fine...but what about an electric start bike?? The lighting system was great for the rear light which was directly off the battery but the headlight was still directly driven and became a flicker when the bike was idling. 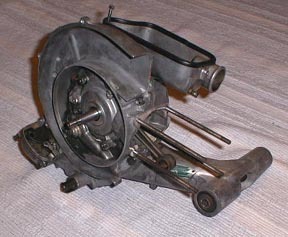 New kickstart quadrant from a later bike (so it will accept a newer external kick start lever). Above is the cleaned and partially restored engine ready for the barrel and piston. 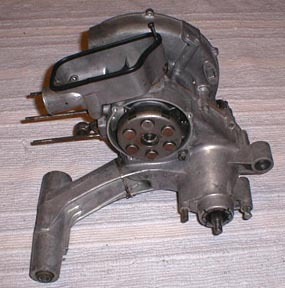 I managed to locate the extra parts needed through the International Scooterist BBS. 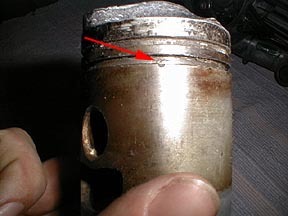 After a closer inspection of the piston I found that the rings were stuck in their grooves so I removed them carefully. The piston could've been re-used but there were some problems that made me nervous. 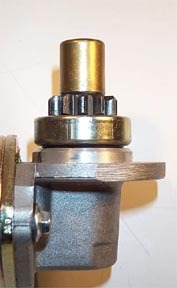 The location pin on the second ring was somehow ground down and no longer held the ring in position and although I have replaced these pins I am always worried they will come loose when the engine is running...so I bought a new piston and rebored the barrel to match it. The frame had 2 holes drilled in the legshields that were used to mount side mirrors. I didn't want to Bondo them as they were visible from both sides. My neighbor suggested brazing the holes so we didn't have too much heat distortion. 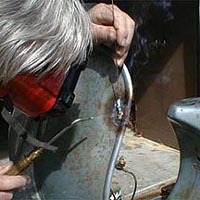 Brazing is similar to welding except the temperature is much lower. 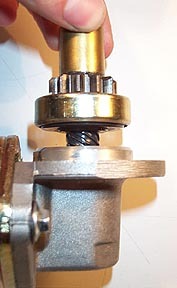 The steel only needs to be heated to a red hot state and then brass is added to seal the hole. 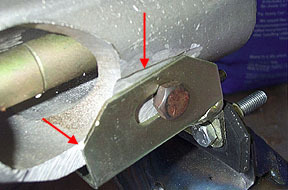 Below is the original condition of the holes. We used an oxyacetelene torch to heat the legshield around the hole until it was red hot and then added brass which was dipped in flux. It was tricky not to blow through the legsheilds and we decided to leave a mess to be ground down rather than expertly brazing the first time round. After grinding the extra brass down we were left with a perfectly smooth filled hole. 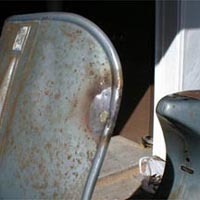 The only clue to the fact that it was there, is the difference in metal color which will disappear with the paint job. 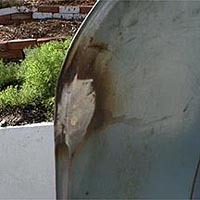 If any blemishes are visible in the brazed surface you can add lead to fill them up by using only a blow torch. 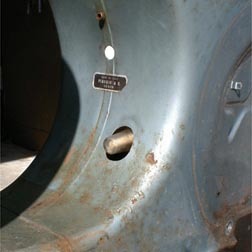 Another frame modification that was made was to add a sight glass hole for the P200E gas tank/oil tank combination. I got a template from an old P200 frame I had and copied it onto a piece of paper. We measured down with a tape measure and drilled a pilot hole. From that point we aligned everything then removed metal with an air powered grinder until it all fit. 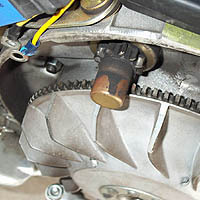 The final frame modification was to the tank filler cap. All my other bikes always slowly leaked gas/oil at the filler cap regardless of the condition of the gasket or the pressure I screwed it down with. 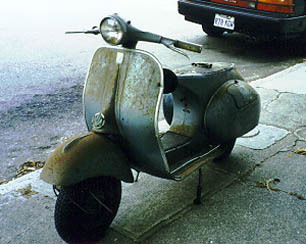 The result is a mess - I had seen some nice motorcycle tank caps that had been adapted for Lambrettas but I had never seen it done to a Vespa. SIP has some retrofit caps but they bolt to the top of the tank and I wanted a flush look. I looked at different bikes and found that the Yamaha Seca II (Diversion in the UK) had a nice sized filler cap that looked good too. 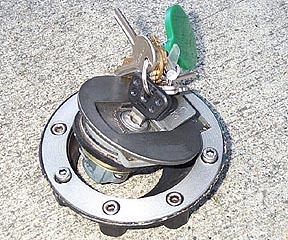 I contacted MIDS Cycle Salvage and they found a cap in good condition and an old tank flange. I didn't want the entire tank so they found a trashed one and cut the filler mount out of it and sent it to me - really nice guys! I ground off the old Vespa filler cap assembly and trimed down the flange from the Yamaha to have about 1/4" of steel all the way around. 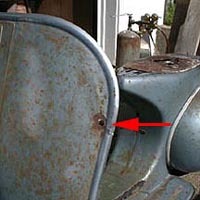 I then marked out a new hole in the Vespa tank and cut it out with a jigsaw. 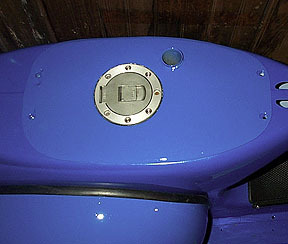 With a little grinding I made the old face of the Yamaha tank mount flush with the new Vespa tank face. 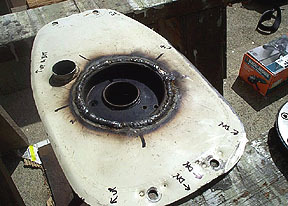 I took it to Tanner Welding in SF who charged me $40 to weld it in place. 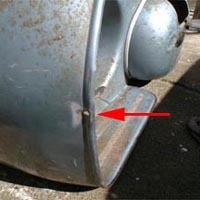 It wasn't the best job I had ever seen and the Vespa tank face had warped from the heat - still it was gas tight and in place. The next step was to grind down the welds to get everything as flush as possible before a final sand with 150 grit paper and using the inevitable filler to smooth everything out. The final result came out pretty well. 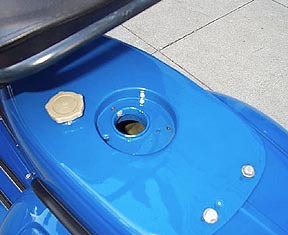 A Vespa fuel tap tool fits through the filler neck too.The Yamaha filler assembly has a small drain in it that allows spilled gas to go back into the tank which should solve any spilling problems. The only downside to this conversion is that the rear rack will no longer work on this bike because the filler cap is so large.Also, I think I may not be able to fill the tank as full as the original Vespa. I plan to adapt a single seat to fit the back anyway so it should work out. 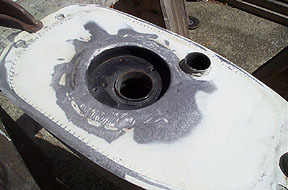 Above is a shot of the welded and painted tank before the filler cap is installed. I wanted to create a headset that was as close to the original but with both a hydraulic clutch and front disk. 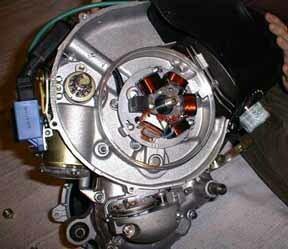 The first problem was how to mount the front disk handlebar unit and allow the throttle tube to turn without the hydraulic reservoir unit turning. I could have used a "quick action" throttle but I think it would look to radical for this scoot. 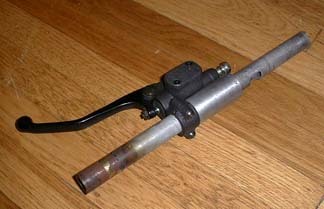 I ended up inserting a small metal tube with a larger diameter than the throttle tube into the end of the throttle side of the headset. This is a tight fit and held in place with PC-7 epoxy. See picture below. 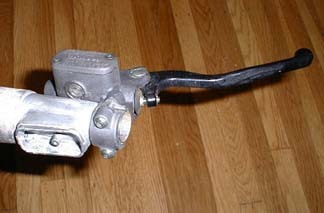 Both sides had to have the original lever mounts cut and ground down to allow for the handlebar hydraulic reservoirs. 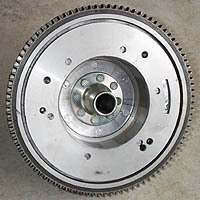 The clutch side bolted right on after machining as the reservoir rotates with the grip. The last item was to lengthen the handlebar tubes by about an inch to make up for the space taken by the hydraulic reservoir clamps. These extensions were braised on with a welding torch.